Witnessing the transformation of the seasons in Rocky Mountain National Park is truly an amazing experience. The seasons are quickly shifting from summer into autumn in Moraine Park this morning. Elk could be heard bugling all around Moraine Park this early September morning. The Big Thompson river is flowing lazily this late in the year, but a heavy frost has coated the grasses along its banks. 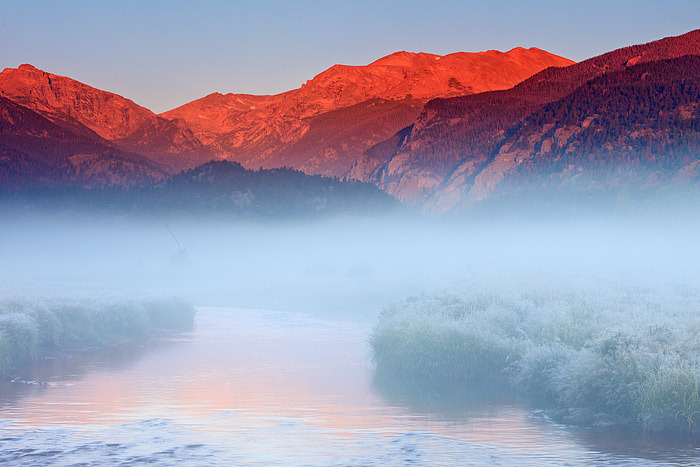 Fog has settled just over the Big Thompson while Stones Peak glows red with the first light of a new day in Rocky Mountain National Park. Photo © copyright by Thomas Mangan.